This large wire vase turns candlelight into modern glow! Insert a candle of your choice inside the glass cup inside and light it to create contemporary shine on your tabletop, mantel, and beyond. Specification Item Weight: 2.6 lbs. 7" x 7" x 23" high; glass holder: 4" x 4" x 13½" high. UPC: 849179014940., ver=11 cid=4, eid=5840, pid=10,12241, lab=XB_071515. 10 LARGE WIRE IRON VASE & GLASS CANDLE HOLDER CENTERPIECES 23 TALL NEW10015425. (You will confirm in the next step). Per 10-Pack - x2 = 20 total , x3 = 30 total - Available only while supplies last! 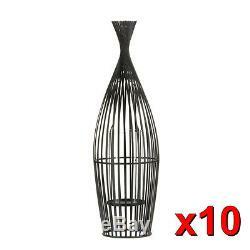 10015425 LARGE WIRE VASE CANDLE HOLDER. 7" x 7" x 23 high. Glass holder: 4" x 4" x 13½ high. This product is Brand New in the box! You get 10 of these! On ANY additional items won. A limit of 4 items can be combined. What is the size, color or measurements of the item? For this item can be found here. How do I contact you? The item "10 LARGE WIRE IRON VASE & GLASS CANDLE HOLDER CENTERPIECES 23 TALL NEW10015425" is in sale since Thursday, July 16, 2015. This item is in the category "Home & Garden\Home Décor\Candle Holders & Accessories". The seller is "xtremebuys4u" and is located in Fontana, California. This item can be shipped to United States.